THE NATURAL HAVEN: Hair: Does it matter if you are Black, White or Asian? Hair: Does it matter if you are Black, White or Asian? In the first installment, we looked at physical hair properties and ethnicity. Here is the rest of the compilation! Hair growth is a contenious subject since there really is only one study for African hair (whose result gave a much reduced growth rate). However the figures are valid for that study and show a much reduced growth rate compared to Asian or Caucasian Hair. Both of these theories have been proven to be wrong since hair across the races is made up of very similar quantities of amino acids. 1. Two labs showed that African hair is slightly weaker than Asian or Caucasian Hair. Asian and Caucasian Hair had similar strength. Hmmm... maybe I haven't done enough research but those differences seem quite significant to me. Doesn't the shape of the hair have important effects in how the hair behaves and responds to products/handling? CHM- I am not convinced on the growth rate actually. While the study is valid it was only based on 35 individuals. I would love it to be expanded and done at different time points in the year similar to the way Caucasian studies have been done. 1. how many cuticle layers are present? The presence of a cuticle and the condition of it are the two main factors as to whether a product will have an effect or not. I do think the shape of the hair is important because it can impact how the cuticle fails. The elliptical shape would probably make it easier for the cuticle to separate away especially under force or when chemically processed (relaxing or bleaching which raise the cuticle). To be honest, most hair products are designed to just sit on hair. Unless hair is damaged most substances are too large to get past the cuticle. The exceptions are water, some oils like coconut and olive oil and some very small proteins. Jc - This is fascinating to me! Thanks for putting it all together so neatly. Is the Caucasian hair in the study straight and of those people who are socially white? I am just a little confused because medium to super curly hair is oval - regardless of race/ethnicity. And I guess those of us from generationally mixed backgrounds would just fit somewhere in the middle of two or three of the groups? Mara not sure what you mean by 'socially white'. The studies I have sited have a mix of Caucasian hair including straight, wavy, curly and different hair colour auburn (brown and red) and blonde. 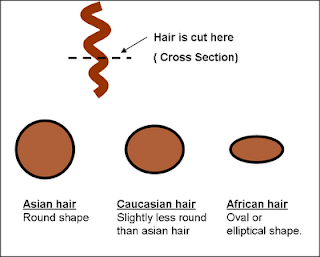 Caucasian hair is slightly oval but not as elliptical as African hair. The study you found was looking at hair growth...does it tell you what state or condition African American hair was at the time the study was being done. Was is relaxed or was it natural? Were they were extensions/wigs/braids or wearing the hair naturally out. I may be biased in saying this but African Americans do alot to our hair especially since our hair the kinkiest of all races and its really now that we are learning how to really take care of hair or retain hair growth through today's information sharing technologies, ie YOUTUBE. 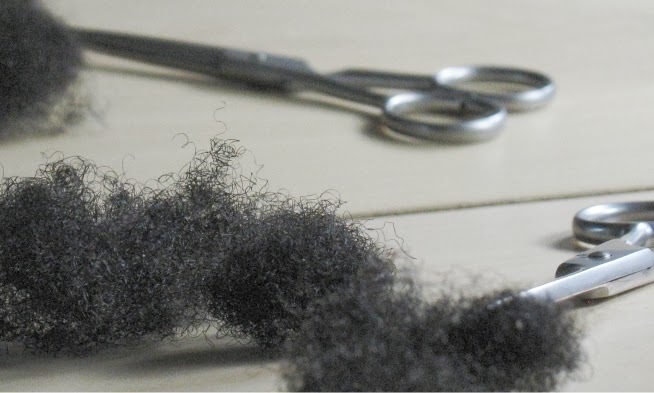 How did the study determine African American hair has less hair growth than the other groups? Were men involved in the study? I remember you posted something in the past normally men grow hair faster than woman due to testosterone (may be wrong on that). First time commenting here! I am transitioning and less than 7 mnths into my journey I had 3.5 inches of growth so it seems that the yearly avg. of 6"-found on various sites on the net, is spot on.. I'm not mixed (well...no more mixed than the avg. Jamaican) so the rate of my growth is not abnormal for a person of African descent. I have always had the feeling that when I run the individual strands of my hair through my fingers, they would feel more or less "flat" and not round. I have different hair types on my head, and especially the "zigzag" ;) parts would feel different than the wavier ones. It has been a mystery to me my whole life. Now I know why! Thank you! 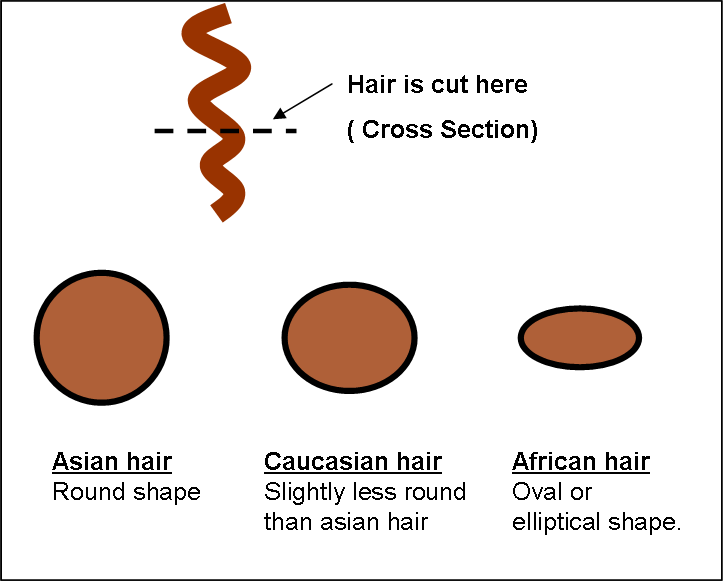 The shapes of different types of hair are just generalities that apply to the straight vs. curly continuum rather than strictly by ethnicity (although some ethnicities tend to have curlier or straighter hair than others, especially those of asian or african descent). I am a woman of Irish-German-Jewish descent with 3c (very curly) hair and my hair is shaped like the one on the right (flattened), as is all really curly hair.